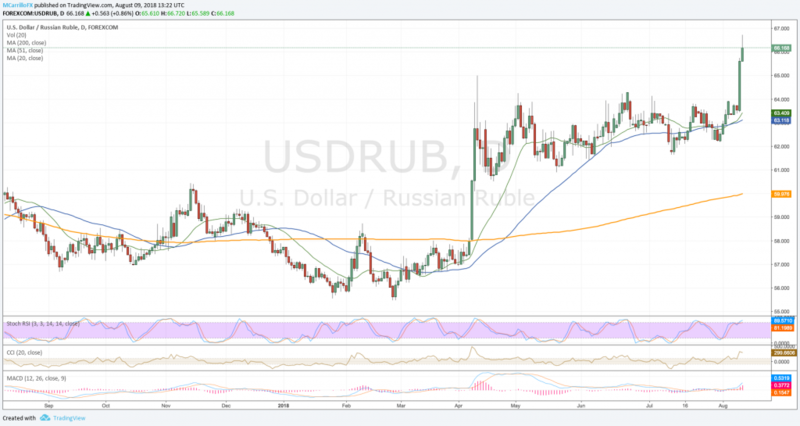 USD/RUB is rallying on Thursday as the pair is extending gains for the second day following news that the US is applying sanctions to Russia amid Skripal nerve-agent poisoning case. Russia said they would retaliate. US State Department announced Wednesday that the United States approved new sanctions for Russia concerning the poisoning of former Russian spy Sergei Skripal and his daughter Yulia in the United Kingdom. According to the US department, they used Novichok, a chemical agent. The sanctions will go into effect on August 22, and it will impact Russian exports of electronics and national security-controlled equipment. The sanctions sent the Ruble 3.5% down against the US Dollar on Wednesday, and the decline continues on Thursday amid fears of new sanctions. The USD/RUB rallied to 66.72 overnight, its highest level since August 3, 2016. The USD/RUB is currently trading 0.81% positive at 66.15. The pair broke the key 65.00 level on Wednesday, and it is currently extending gains. Technical indicators are suggesting further gains in the following days. To the upside, the pair is now facing resistances at current high of 66.73 and 67.10. Above there, check for 68.80 and 71.40 as next selling areas. To the downside, immediate support lies at 65.00; below there, check critical buying area at 64.25 and the 62.00 level.